Why have a Parish Priority Plan and how did we get here? Last year, Bishop Noonan selected Most Precious Blood parish to participate in a pastoral planning process called Next Generation Parish. From the 90 parishes in the Diocese of Orlando, he chose us along with eleven other selected parishes. The timing was good. 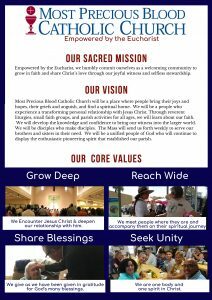 In 2014, Most Precious Blood had discerned its 2020 Vision of Faith. 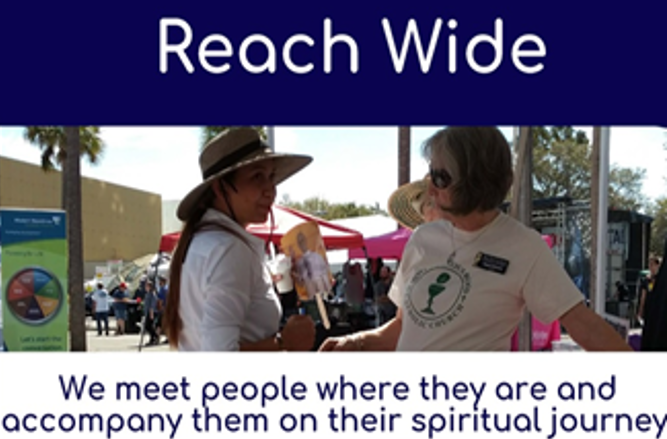 With zeal, we had sought to reach wide, grow deep, share blessings and build faith. We were at a point where we could look at our progress and consider how we wanted to go forward. First, we looked back. 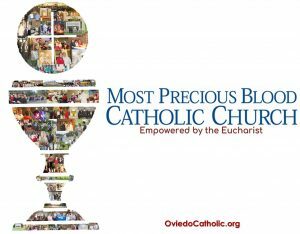 We recalled how Bishop Wenski established Most Precious Blood on April 24, 2005, in response to the booming population in the Oviedo area. Sunday Mass moved from Oviedo High School (2005)to Lawton Chiles Middle School (2006) to our campus on Lockwood Boulevard (2011). Father Stephen Parkes and the first parishioners, with courage and sacrifice, made the dream a reality. Empowered by the Eucharist, they created a place where people could bring their joys and hopes, their griefs and anguish, and find a spiritual home. Here all people could experience a transforming personal relationship with Jesus Christ. 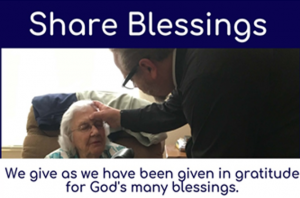 Reverent liturgies, small faith groups, and parish activities for all ages would form us in faith and send us to serve. The past year, with the guidance of the Catholic Leadership Institute, a team of ten parishioners including myself studied parish statistics and history, summaries from site visits and interviews by our consultants, and national and local trends. For example, we learned from the 500 parishioner respondents to the Disciple Maker Index parish survey in February 2018 that while our parish excels at welcoming people there is a gap between the desire for spiritual growth and a living relationship with the Lord. We learned that 9 in 10 infants baptized in the Catholic Church in the United States leave the Catholic Church by the time they are adults. Only 7% of Catholics are highly engaged. Having considered these matters, we discerned a Parish Priority Plan. At the Sunday Masses of January 5th & 6th, I presented to you the first part of our Parish Priority Plan. For the month of January 2019, I am talking at Mass about our parish: why we exist, where we are going, how we will get there, and what our priorities are. The magi found the newborn Savior of the nations in a stable in a corner of a forgotten village in an unimportant country with a hostile king. They found him thanks to a star. Rising in the east, the star led the magi to the Lord. In the same way, our parish has a star. It has guided us from our foundation. Our guiding star is Our Sacred Mission. 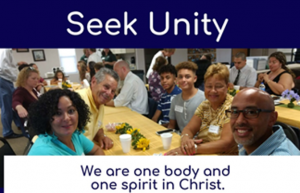 I invite you to take a moment to reflect on how it inspires you: Empowered by the Eucharist, we humbly commit ourselves as a welcoming community to grow in faith and share Christ’s love through our joyful witness and selfless stewardship. Our Sacred Mission leads us to the Lord. It sends us forth to announce the good news. It’s safe to say that our parish does not have a sacred mission as much as that our sacred mission has a parish. Our Sacred Mission is the reason we exist. Finally, we have a Unifying Message. It is part of our parish logo. If you cannot remember the Sacred Mission, remember our Unifying Message. It’s the first four words of Our Sacred Mission. Use it as your password. Paint it on your car door. Tattoo it on your heart: Empowered by the Eucharist. What is the Priority Plan? Most Precious Blood Catholic Church will be a place where people bring their joys and hopes, their griefs, and anguish, and find a spiritual home. We will be a people who experience a transforming personal relationship with Jesus Christ. 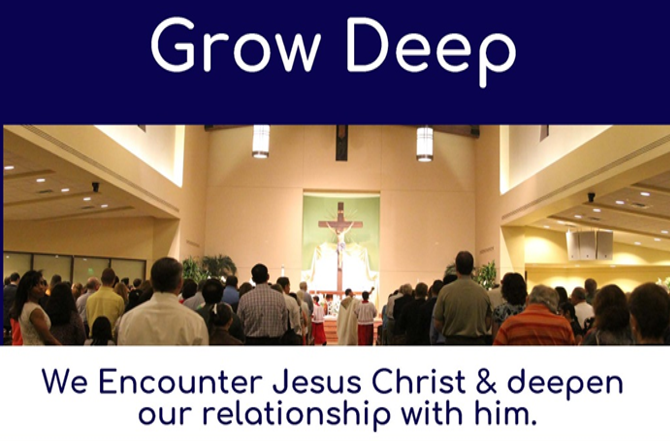 Through reverent liturgies, small faith groups, and parish activities for all ages, we will learn about our faith. We will develop the knowledge and confidence to bring our witness into the larger world. We will be disciples who make disciples. The Mass will send us forth weekly to serve our brothers and sisters in their need. We will be a unified people of God who will continue to display the enthusiastic pioneering spirit that established our parish.